Caravan Camping Sardinia: holidays by caravan! There are numerous (mostly shaded) pitches for those with a passion for camping by caravan. What could be better than a caravan holiday in Sardinia, immersed in nature with numerous amenities on your doorstep? 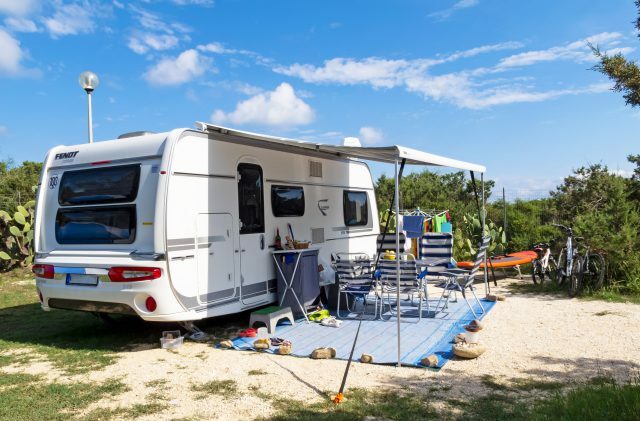 At Camping Cala Ginepro, you can make the most of your caravanning holiday amid the marvels of the eastern coast of Sardinia. On your caravanning holiday in Sardinia, you can choose between the two sandy beaches and the evocative reef. And whenever you want, you can forget about cooking...the pizzeria – with its wood-fired oven – and the restaurant are always open, serving up delicious specialities from the land and the sea, which are also available to take away. During your caravanning holiday at Camping Cala Ginepro, you can always use the hot showers free of charge; electricity is also free. In addition, you can dispense potable water whenever you need it, thanks to the drinking fountains located along the paths of the campsite. The caravan charge includes: space for a canopy or parasol with standard dimensions; entry for a car or a motorbike; and parking in the dedicated communal areas. Moreover, for a small daily charge, an additional kitchenette, an oversize parasol or a gazebo can be put up. Discover all of the services available to you during your caravan holiday in Sardinia!